Heroin recovery is difficult but possible. When you embark on the journey, you might have a mixture of determination, excitement, regret, and dread about what the journey will entail, and that’s understandable. No one typically wants to voluntarily go through pain, and the reputation of detoxing from heroin is strong enough to make many people opt to just stay addicted. But not you! You’ve seen how heroin robs from you, not just possessions and comforts, but even the lives of those who are nearest and dearest to you. You’re willing to travel all the way through this journey at any cost. The journey will not be easy, but if you have a firm and accurate idea of what it will entail, you’ll be able to say to yourself, “OK, I’m in this stage of recovery. This is normal. Other people have traveled this road before me. I’ll keep putting one foot in front of the other.” We hope this will help you to succeed. Your body and brain are addicted to the drug, and it takes some time for all that to work its way out of your system. Your symptoms will probably peak after 1-3 days and then diminish over time from there. Here at Eternal Awakenings, our doctors can prescribe medications that help you to alleviate the acute symptoms of withdrawal. Because these symptoms can persist for much longer than your physical withdrawal symptoms, it’s important to have a strong support network or attend a recovery program that lasts longer than the first few weeks. Running into these things can cause you to relapse (or struggle greatly). In order to ensure that you are giving yourself the best possible chance at sustained recovery, it’s a great idea to enroll in a rehab program that lasts longer than just a few weeks or months. 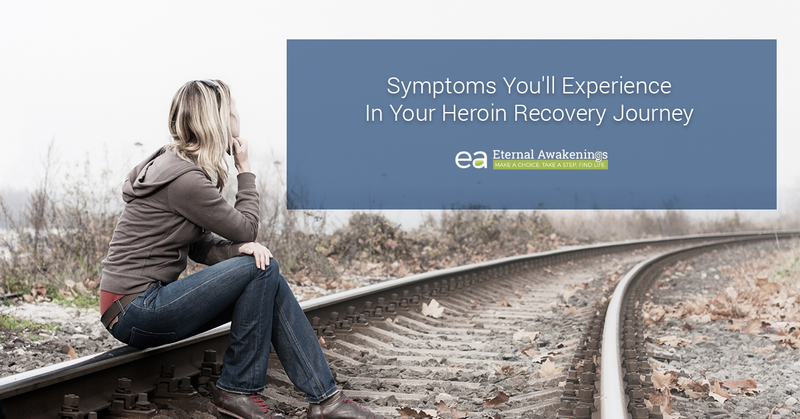 Eternal Awakenings offers onsite rehab in a caring environment that provides the support you need for the time beyond when your physical addiction is broken. It is very, very hard to convince ourselves to leave something behind that gave us pleasure, even when we are totally logically convinced that it is bad for us. Working through the aftermath of leaving heroin behind, your brain will be craving it, begging you to go back to it, and screaming loudly at you to get relief by trying it just one more time. Ideas have consequences. The key is to eliminate the ideas that have detrimental consequences and replace them with better ideas, ones that lead you to stability, prosperity, and health. You can’t expect to just flip a switch and kick out all the bad thoughts and watch a flood of good thoughts rush in. There is a lifelong process of identifying and eliminating unhelpful thoughts, finding a better thought to replace them, and then acting according to the new thought. The ability to change your thinking in this way can make a big difference in your long-term recovery, but it usually doesn’t come automatically. When you have help and guidance, you can get a head start on engaging in this process. Eternal Awakenings offers you Christian-based counseling as part of your drug rehab. When you come here, you’ll learn how to identify and deal with unhealthy thoughts and replace them with the positive thoughts that will form a solid foundation for a healthy life. If you are looking for a place where you can call home for the next few months while you detox from heroin, consider Eternal Awakenings. Don’t leave your recovery to chance. Come to the place where we understand you, where we will support you, and where we believe your successful, long-term recovery IS possible.